We have progressed with the growth of children. BNANAMI has been growing with supplying equipment especially for kids. Using traditional Japanese woodworking techniques, NANAMI started manufacturing blackboard erasers and sketch boxes for children just after World War 2. NANAMI has always been supplying products which have been considered users sensibility and satisfaction using variety of materials, plastic, metal, fabric and wood. Manufacture and sales of wooden and plastic teaching aids, play equipment and other equipment used in kindergartens and nurseries all over the country, as well as interior furniture, office equipment, and materials for packaging and hobbies. We have a wide range of products, including wooden and plastic toys such as "Lanlock", which received the Bronze award at the 1984 International Exhibition for Educational Materials and Professional Training held in Basel, Switzerland. Unique products are continually being created, including wooden furniture which received the Director-General's Award of the Ministry of International Trade and Industry in 1978, FRP(fiber reinforced plastic) play equipment, plastic bone structure model "Hyoukin Honeemon", plant cultivation kits, learning materials such as electric experiment kits, products such as "Ponpon make"and "Make flower Hanako-chan" to spare the trouble of kindergarten teachers and nursery staff, wooden stationery items and wooden boxes for packaging. 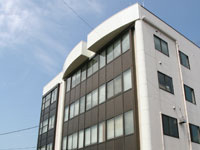 Shizuoka Shinkin Bank, Oguro branch.